Chateau Fombrauge is the largest vineyard in St. Emilion. 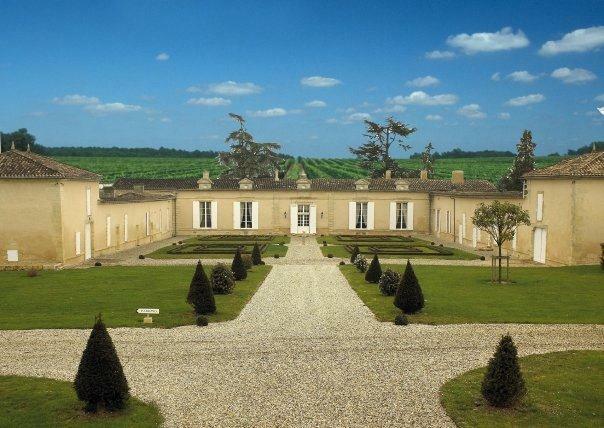 It is also one of the oldest estates in St Emilion as it dates back to 1679. Although vines were cultivated on the site as far know as 1599. The charming, regal chateau is one of the nicest chateau in the Right Bank. In fact, it would be at home next to any chateau in the Medoc! Chateau Fombrauge takes its name from one of the earlier owners, Dumas de Fombrauge, who was also a member of the French government in the 1700’s. However, the modern age for Chateau Fombrauge really starts in 1999, as that was the year Bernard Magrez purchased Fombrauge from the Hans Just company. One of the first moves made by Bernard Magrez was to hire the ubiquitous Michel Rolland as their consultant. Chateau Fombrauge is one of the numerous estates owned by Bernard Magrez who also has properties in the Left Bank, Sauternes and of course in Pessac Leognan with Chateau Pape Clement. The massive, 60 hectare Right Bank vineyard of Chateau Fombrauge is planted to 90% Merlot, 8% Cabernet Franc and 2% Malbec. The vineyard is perhaps the largest, or at least second biggest vineyard in the Saint Emilion appellation. This new planting represents a change in the vines, as today, the amount of Merlot has increased and all the Cabernet Sauvignon vines have been removed. The vines average 30 years of age. The vineyard is planted to a vine density of 6,600 vines per hectare. The terroir is clay, limestone and sandstone soils. But as you might expect, it’s more complicated than that. The vineyards are basically located in 3 sections, with parcels close to the chateau on the slopes and flats, and they have also have vines that placed not too far from Chateau Pavie, on the limestone slopes with southern exposures. To produce the wine of Chateau Fombrauge, following a 4 to 8-day cold soak at 10 degrees Celsius, the berries are moved to large, oak tanks for fermentation. For the vinification of Chateau Fombrauge, the estate utilizes 40 vats that are a mixture of wood, cement and stainless steel that range in size from 80 hectoliters to 20 hectoliters. The vats are divided as follows, 21 wood vats, 18 stainless steel tanks and 8 cement vats. The grapes are whole better fermented. Malolactic fermentation is usually equally split between cement or steel vats and French oak barrels. The wine of Chateau Fombrauge is then aged in 50% new, French oak barrels for an average of 16 to 18 months before bottling. The actual length in barrel of time can vary, depending on the character of the vintage. Previously, Chateau Fombrauge produced a white Bordeaux wine, but that is no longer the case. The wine is now called Chateau Magrez Fombrauge Blanc and is associated with the other Saint Emilion of Bernard Magrez, Chateau Magrez-Fombrauge. This change took place starting with the 2011 vintage. For the production of their white Bordeaux wine when it was produced as Fombrauge Blanc, the wine was typically a blend of 40% Semillon, 30% Sauvignon Blanc and 30% Sauvignon Gris. The wine was produced from grapes planted in their slightly cooler, mostly limestone soils. Close to 14,000 cases of wine are produced at Fombrauge in most vintages. There is a second wine, Prelude de Fombrauge. The second wine was previously sold under the name of Le Cadran de Fombrauge. Chateau Fombrauge is made in a modern, forward, ripe, lush, open, style. Due to its fairly large production, the wine is still sold to consumers for a fair price. Starting with the 2010 vintage, Chateau Fombrauge began taking anti counterfeiting measures for their wines using the Intaglio method of bottle etching coupled with Spottag, which adds an invisible ink mark to the labels. Chateau Fombrauge is better with at least 4-6 years of bottle age. Of course that can vary slightly, depending on the vintage. Chateau Fombrauge is best enjoyed in the first 5-20 years of life. Chateau Fombrauge is best served at 15.5 degrees Celsius, 60 degrees Fahrenheit. The cool, almost cellar temperature gives the wine more freshness and lift. Chateau Fombrauge is best paired with all types of classic meat dishes, veal, pork, beef, lamb, duck, game, roast chicken, roasted, braised and grilled dishes. Chateau Fombrauge is also good when matched with Asian dishes, rich fish courses like tuna, mushrooms and pasta. Forward, soft, round and on the fresh side, this wine offers sweet, black cherries, licorice and dark chocolate. Made from a blend of 93% Merlot and 7% Cabernet Franc, there is a bittersweet, cacao overtone floating in the juicy, red plum finish, adding more richness on the palate. Round, forward, soft, lush and polished in character, there is a sense freshness that keeps the wine on its feet, allowing the black cherry, cocoa, licorice, smoke and espresso filled wine to stand out in a crowd. Forward, round and easy to drink, this wine displays its licorice, black cherry, smoke and espresso with ease. Black raspberry jam, licorice and espresso are the key to the character here. Medium bodied, round and forward, this will offer delicious, ripe, fruity, black raspberry and red plum qualities with sweetness on release. The wine easily shows of its nose of espresso, dark chocolate, licorice and ripe, fleshy, sweet, round black cherries. Richly textured on the palate, the wine leaves you with sweet, soft, polished, ripe, red fruits. Forward, soft, silky and lush, the wine shows off with its espresso, dark chocolate, licorice and ripe, fleshy, sweet, round black cherries with just a swirl. This is the best vintage Fombrauge has ever produced! Already open and easy to drink, this forward, lush, round textured wine shows off with its espresso, dark chocolate, licorice and ripe, black cherry character with ease. Spice box, flowers, licorice, smoke and black raspberries create the nose. In the mouth, this wine is supple, flashy and round, with loads of spicy, smoky, dark red fruits and espresso beans that carry through. Light and forward, with an earthy, cherry and oak entry, this will be drinkable on release. A really nice wine here. Popped and poured late into the evening, the wine has an open, forward, corpulent, ripe, juicy personality. Lots of licorice, chocolate covered black raspberries, vanilla bean and plum. Drink it now for its hedonistic qualities, or age it for secondary characteristics. Produced from a blend of A blend of 77% Merlot, 14% Cabernet Franc and 9% Cabernet Sauvignon, from low yields of 27 hectoliters per hectare, the wine reached 15% alcohol and does not display any sensation of heat. This is the best wine I've yet tasted from Fombrauge. Licorice, truffle, cocoa, black cherry and coconut aromas, soft, round, polished textures and an open, medium bodied, fennel, chocolate, plum finish are what you'll find in this well-priced St. Emilion wine. Light ruby in color with coffee, herbs and cherry aromas, this medium bodied wine finishes with an oaky, cherry finish with hints of green flavors. Drink this on the young side. Fully mature, medium bodied, with a truffle, licorice, herb and black cherry personality, this requires drinking sooner than later. Licorice, stone, smoke, soil and plum aromas lead to a medium bodied wine. In the mouth, there is a dryness to the palate, with some hints of green olives in the red berry finish. Perhaps time will help the wine. Smooth and soft, this medium bodied, round textures wine is open, and ready for drinking with a blast of oak, licorice, cocoa and cherries in the finish. Smoky red berries, black raspberry and licorice make up the perfume. Still young, the fresh, soft, cherry dominated wine has some tannin to resolve. Give it a few more years in the cellar before opening a bottle. Still young, with good color, the wine required air and coaxing before the licorice, jammy black raspberry, black cherry, coffee, cocoa and spice scents emerged. From an assemblage of 77% Merlot, 14% Cabernet Franc and 9% Cabernet Sauvignon, this full bodied, supple textured, St. Emilion wine demands a few more years of bottle age. Medium bodied, oaky, with a licorice, jam and black cherry personality, this is past its best years and requires consumption. Fully mature, this open, round, supple textured wine is filled with sweet, ripe, jammy berries, earth, cocoa, fennel, espresso, smoke and black cherries.